Maximizing Progress: Census Dotmap ~ Visualizing North Americans! 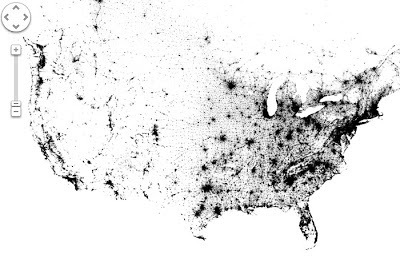 "This is a map of every person counted by the 2010 US and 2011 Canadian censuses. The map has 341,817,095 dots -- one for each person. [...] Technically, as the available census data is only available on a block level, all dots are placed randomly within each block's perimeter."